Anyone that has attempted covering an event live via a social network like Twitter knows this can be a difficult job. The tweeter has to act as both a reporter, covering the relevant information of what is occurring and what is being said at the event, and a community manager, responding to the reactions and impressions of people following the event and sometimes selecting tweet questions to share, personally or through the moderators. 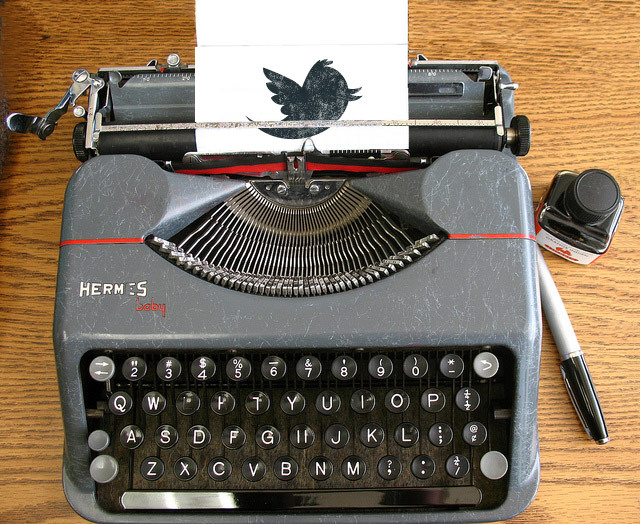 If the twitter back channel for an event becomes robust, then an already difficult job becomes moreso. One complication is that there are potentially several related conversations about the event taking place at once within Twitter. Using a Twitter hashtag (a # sign followed by a key word) is one way to manage and organize the discussion within Twitter, but the stream can be very rapid if there are are a dozen or more people involved, especially if those tweeters tend to RT messages sent by others in the stream. Some conversation might branch off from the main conversation as well, dropping the hash tag as they continue. Another complication is that the very nature of tweeting diverts some attention from the event in order to compose a well-crafted summation of the proceedings. Live tweeters often miss key points and messages from speakers, especially in large round table discussions or events with multiple points of focus. Multiple contributors using a common hashtag for the event can make up for this gap, but for some users, the level of noise in the tweet stream, from multiple authors, retweets, and off-topic comments – can eliminate any type of narrative to the story. Storify is a free service that allows an editor to tell a narrative story of an event by pulling in materials from various social media sources, such as Twitter, photos, and videos. The application allows a reporter to leverage the power of the crowd to create both a sense of time and place and a larger sense of coverage than a single person can. We have so many real-time streams now, we’re all drowning. So the idea of Storify is to pick out the most important pieces, amplify them and give them context. Reporting on an event through social media and crowd sourcing where assets ‘on the ground’ are limited, such as natural disasters, large scale protests, etc. Drag and drop material from social media sources into your story – attribution and metadata is stored with each element added to the story. Storify writers can send a message to all people quoted within a story. By informing others that they have been quoted, you increase the chances they’ll share with their social media audiences, increasing exposure to the story. 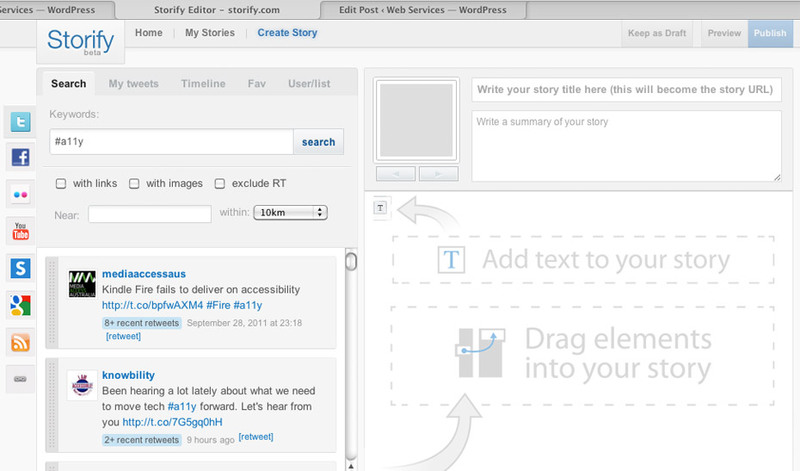 Stories with Storify are interactive: readers can re-Tweet or reply to the people quoted in stories. Storify uses publicly available content in line with the terms for use provided by its sources. Its use of attribution and notification helps to ensure that copyright and content is kept with the sources of the story. Storify allows an event to be told from the perspective of many different involved parties, which in turn can be more engaging for a variety of online audiences. A user’s Storify articles are displayed on a profile page located on the Storify website. You can either direct readers to that profile or to a specific story, or you can use an embed code and place it in on your own website. Others can also embed your story, and Storify maintains metrics to measure where it has been embedded and how many views it receives. Crowd sourcing news can lead users to question the validity of the information being presented, as opposed to news that has been vetted by a journalist. Storify’s reliance on the curator calls into question whether the information being presented is balanced, objective journalism. The act of picking items to highlight can lead to very subjective accounts of global events, and as a result, requires news organizations to enforce journalistic standards transparently to their audiences. The screen capture from Story.com shows how simple the interface is to use. A user uses the search box to search for a topic, and the icons to the far left to select a social media service. Results are presented in the left hand column, and can moved into the story window using click and drag motion with the mouse. Items can be moved and up and down in the time line using the same method. Authors can add text blocks in between social media excerpts as needed. Website Maintenance Scheduled for October 14th.